Johannes Piscator (1546–1625) may not be a household name today, but that is hardly for want of an international, multi-generational legacy. His clear and firm stance on God’s justice as revealed in the judicial laws of Moses influenced giants of Reformed theology for nearly two centuries afterward. As the reader will learn, Piscator’s views were held by several key figures, helped shape the Puritan movements and governments in both England and America, and influenced the formation of the Westminster Confession of Faith. It is time that this nearly-forgotten theologian, and his doctrine of the law, be resurrected and given a rightful consideration among the hall of fame of Reformers. 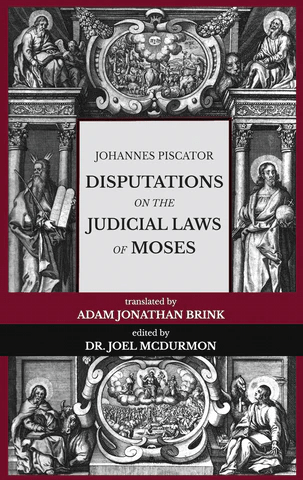 To that end, we present Piscator’s work on the judicial laws of Moses most often cited often by subsequent writers: the Appendix to his commentary on Exodus. Originally titled “Observations on Chapters 21, 22, 23, namely, an explanation of controversial questions about the abrogation of the judicial laws of Moses,” it is here published as a stand-alone book: Disputations on the Judicial Laws of Moses. Christ and the Lex Talionis. A parallel to the unchanging moral laws. 1. The judicial law was for Israel only. 2. The judicial law as only an example. 3. The judicial law does not forbid revision of itself. 4. The judicial law requires revision of itself. 5. The judicial law is not detailed enough. 6. The judicial law no longer binds unless it is repeated in the New Testament. 9. Must we become Jews first? 10. Jewish legislation ended with Christ’s Advent. 11. Jeremiah and the New Covenant. 12. The Gospel does not affect civil governments. 14. The judicial law existed only to distinguish Israel until the Blessed Seed should come. 15. Paul refutes the judaizing Ebionites and defends diverse civil customs. 16. The entirety of the law was abrogated after John the Baptist. 17. Christians are free from the yoke of the entire law. 18. Galatians establishes the abrogation of both the judicial and the ceremonial laws. 19. Paul and Peter require Christians to obey pagan magistrates.